For the Festival of the North East, which will take place in June, museums all around the North East got together to select a hundred objects that together portray the history of the region. Beamish will contribute with six objects. These objects were already on display on site, but will get some extra attention during the festival. 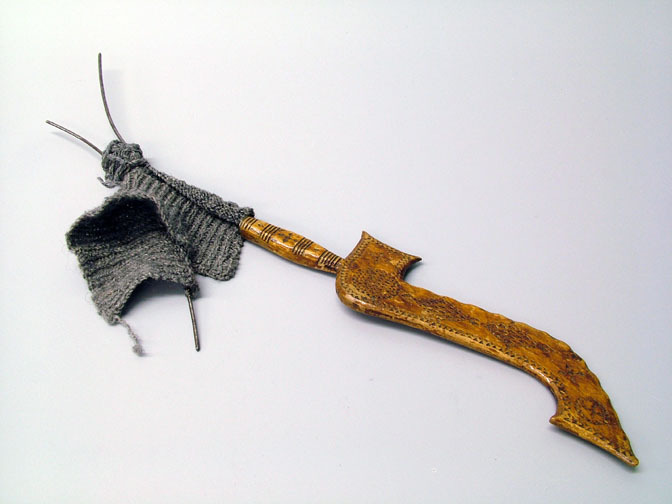 While researching these objects, there was one that particularly appealed to me: the knitting sheath. 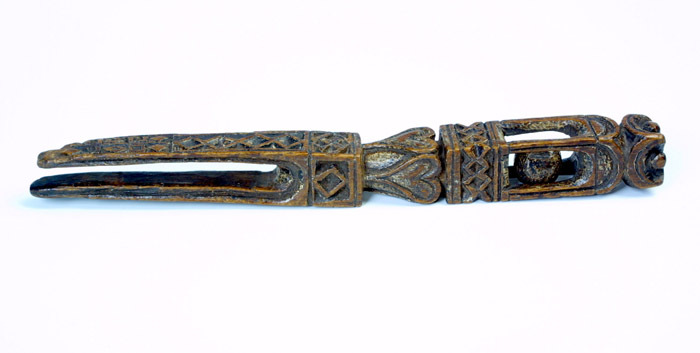 This once ordinary object has now largely been forgotten about, but is a great example of an object telling both a very sweet and personal story and representing the history of an entire region. 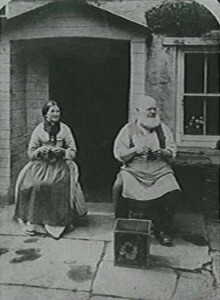 In the early nineteenth century, it was customary for old and young people in the northern counties, both men and women, to supplement their wages by knitting. Children learnt to knit in school, in some places it was as important a skill as reading and writing. In the evenings, people often got together in someone’s house to knit, the so-called ‘knitting dos’. 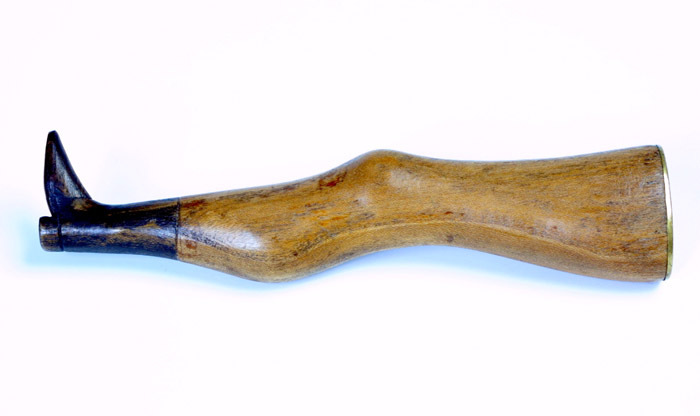 The knitting sheath was a useful tool because it allowed people to keep on knitting while doing other jobs. The sheath was tucked into the knitter’s waistband or belt, or even stitched on an apron. 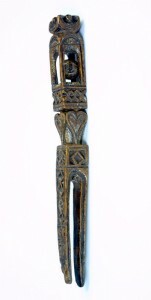 Each sheath had a short tubular opening on the end to hold the needle, and a way of attaching it to the clothing. Sheaths were worn at the right-hand side and were used by knitters who worked in what was called the ‘German manner’. In this way, the right hand was kept rigid and that is where the knitting sheath came in. Its use was to steady the right hand and knitting needle. They were mainly used in the North of England. Knitting sheaths were not made to sell, but were designed as gifts. Most of them were presents from young men to their sweethearts. 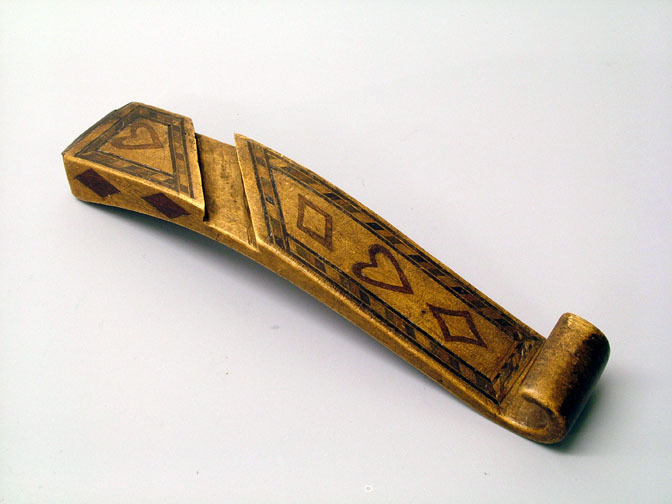 Sheaths were thus often carved with emblems such as hearts and arrows, together with the initials of the giver and those of the girl. 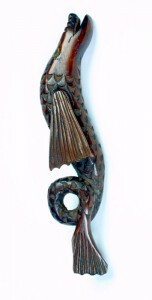 On most sheaths, the carving is very carefully done, with some inlayed with ivory, mother-of-pearl or different coloured woods. 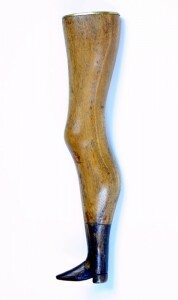 Since they were all made by hand by amateurs, each knitting sheath is unique and there are a variety of types, mainly depending on the area they were from. 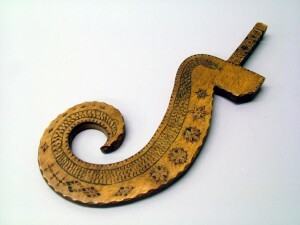 Sheaths were made from different materials, people used whatever was available. Materials include wood, bone, leather with wood splinters, balls of horsehair, bundle of feathers tied together and goose-quills fastened upon a piece of flannel. During the late nineteenth and early twentieth century the knitting method with the sheath gradually fell out of use, since education authorities considered it to be harmful to the posture, producing a weak chest and rounded shoulders. Instead, children were taught to knit without the sheath, in the modern manner used today. This entry was posted in Adventures in Collecting and tagged collections, Festival of the North East, folk art, knitting, love tokens on May 28, 2013 by BeamishMuseum. Recently donated to the museum was this very cute and very special little horse, Bronco, owned by the donor since she was a child. Since ‘tweeting’ the arrival of our new friend a flurry of messages from other Bronco owners demonstrated the toy’s popularity, charm and the obvious nostalgia it creates. It soon became apparent after delving into the history of this toy horse that it was part of a popular British-made toy company who developed a range of ‘Mobo’ toys, including Bronco. Bronco, the toy horse was made of steel and painted white and grey, with a red and gold saddle, stirrup and reins and black mane and tail. The iconic label of the company, a clown in a yellow circle, was stamped onto the toys. The Mobo logo is broadly the same on each toy. 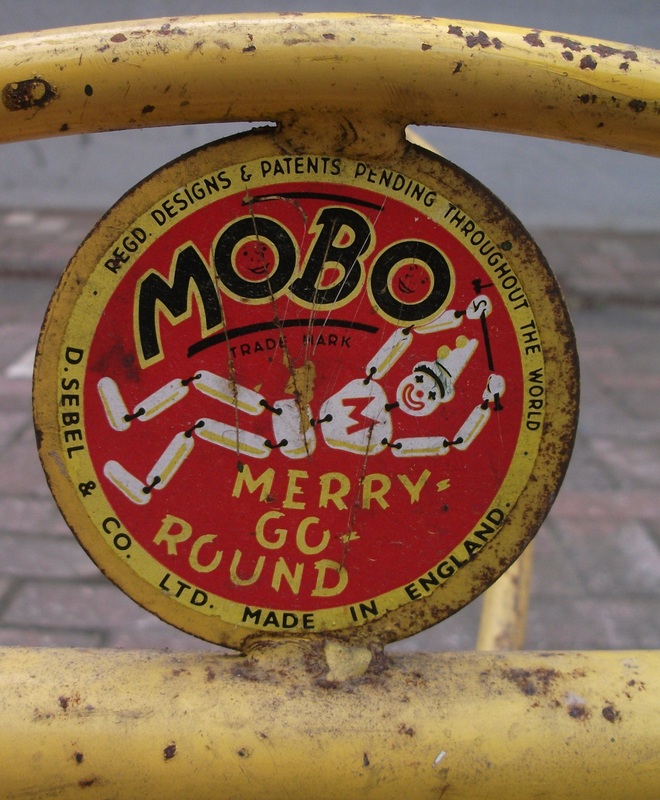 The toy manufacturer D. Sebel & Co. Ltd, who made Mobo toys, was based in Kent where they produced toys from 1947 up until 1972 when cheaper products abroad out-produced those made by the British company1 2. However, proceeding the company’s focus on toy production, the founder David Sebel originally established himself as a wheelwright in 1921, in London (after emigrating from Russia), before gradually expanding the business along with his son, Harry, to produce metalwork for commercial markets. During WWII, D. Sebel & Co. produced metal parts for tanks and aircraft and for buildings including towers and bridges. It was after the war that the company expanded further into furniture-making and then in 1947 into toy-making1. Mobo toys were finally born. 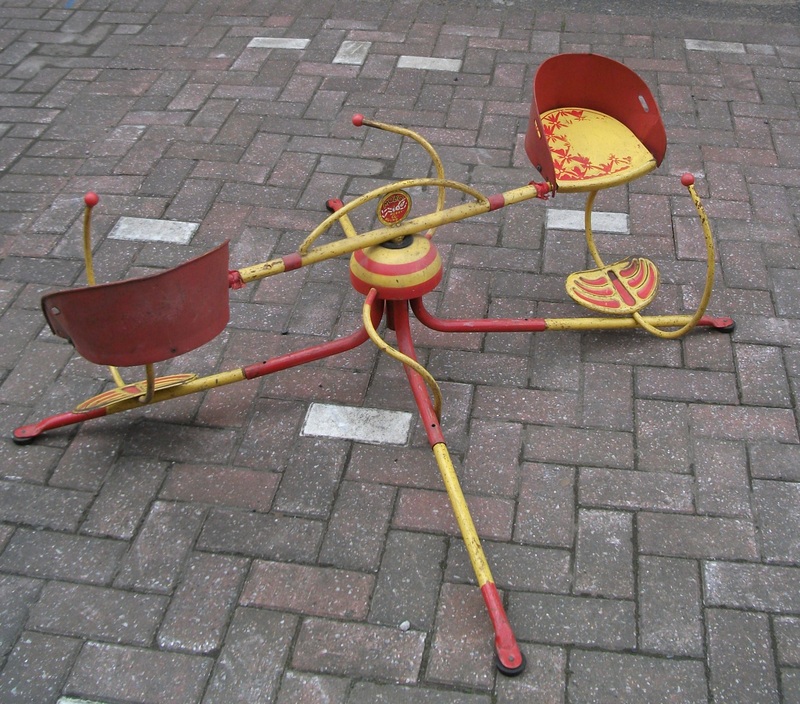 Although the company specialised in metalwork, plastics were adopted in toy production in the 1960s. 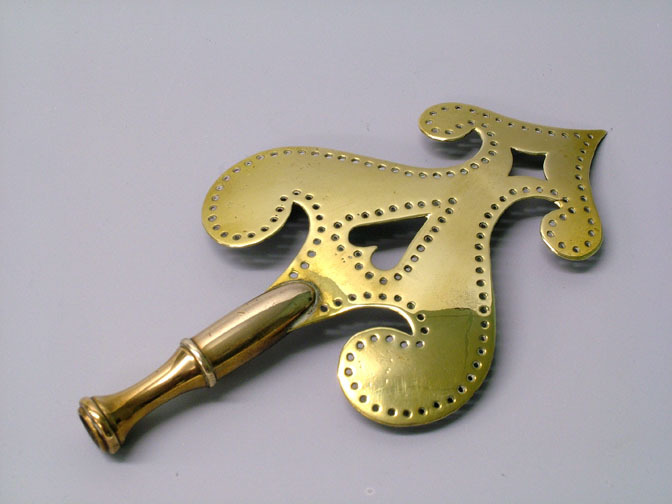 It has been suggested1 that pressed metal was the bridge linking the development of wooden and plastic-made toys. America became a strong market for Mobo toys where the sister company Sebel Products Inc. was established. 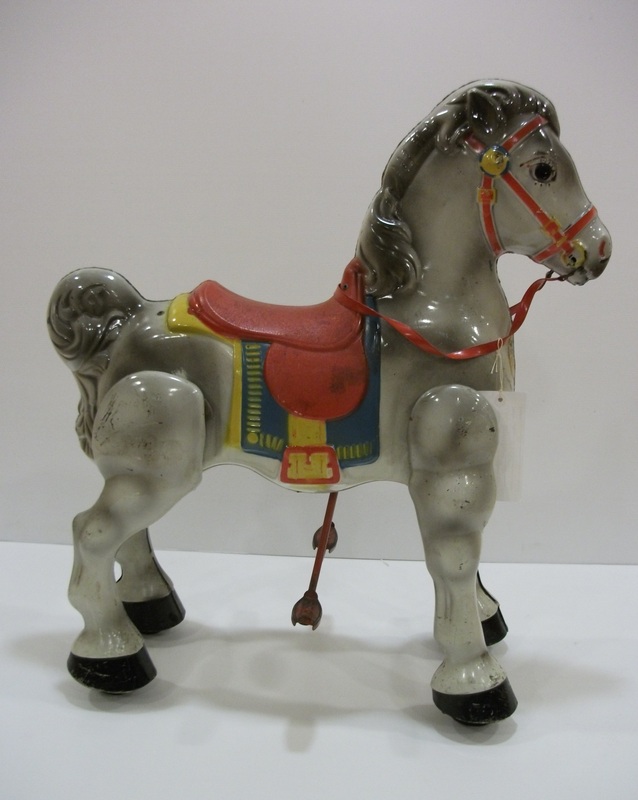 However, similar toys also started to appear that were produced by other companies, including Marvel the Galloping mustang created by the Louis Marx Company3. Australia was another focus for D. Sebel & Co., and in 1951 they established their toy and furniture company in Bankstown, New South Wales. 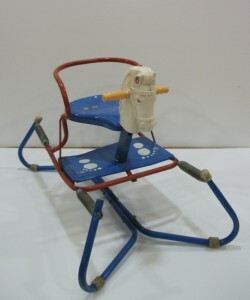 Furniture became the main focus for the company, even though the toys were quite popular. Interestingly, today, GWA International Group owns this company1 – and so in a way, the efforts of D. Sebel & Co. still live on. 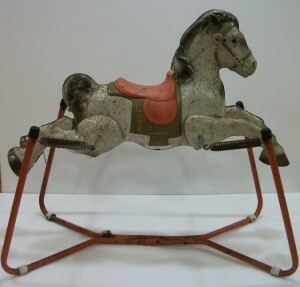 The Bronco horse was one of the most popular of their creations and could be ridden and moved by pushing down on pedals which in turn moved the horse’s legs backwards and forwards. In 1950 the company developed ‘Magic Steering’ enabling the horse to change direction by using each pedal independently. The colour of our Bronco appears to be the most common, but apparently other colours were also introduced by Sebel, including black horses with gold and red saddles, and brown horses with tartan saddles1. 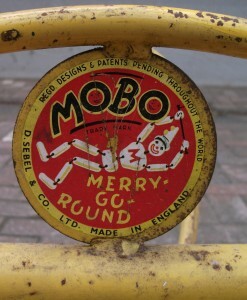 Other ride-on toys were also produced by Mobo, including the ‘Walking Snail’2, ‘Mobo Ponies’ and the ‘Pony Express’ as well as bicycles, swings, scooters and peddle cars. 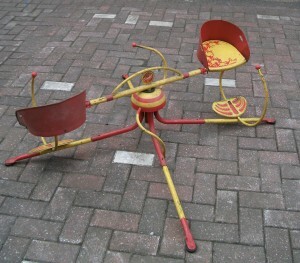 We put this Merry-Go-Round back together and it still works nicely – although sadly we are too large to play on it. Within our collections here at the museum we have a few other Mobo toys, including a Prairie King spring horse, small child’s rocking horse, and Merry-go-Round (all pictured). It would be interesting to know if anyone remembers owning or still has any of these other Mobo toys or a different coloured Bronco! 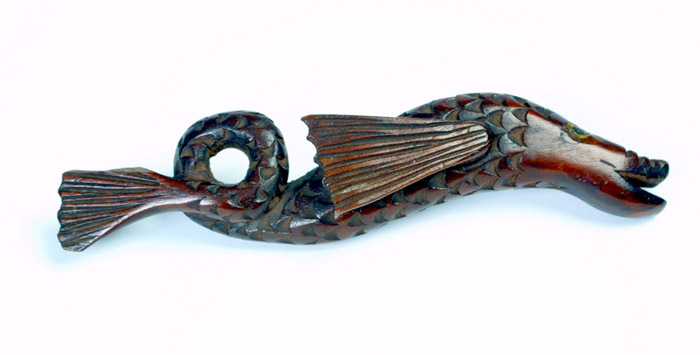 This entry was posted in Adventures in Collecting on May 3, 2013 by BeamishMuseum.